Home → → Pristine White Casting Plaster - Case - 36 lbs. When a piece of sculpture is completed, the artist often-times wants to make reproductions of the work. To make the reproduction, a mold and cast of the model is made in one of a variety of casting mediums. The most popular mold making and casting compound in sculpture is casting plaster, a US Gypsum material. 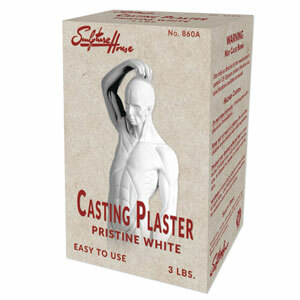 Our Pristine White Casting Plaster, is a pure white, smooth, slow setting plaster for casts, molds, and direct modeling. Can be used for mother molds and has enough strength to create positive casts. Packaged Case/12 3-lb. boxes/36 lbs.